Jack Hammer 2: Fishy Business is an online video slot game from Net Entertainment that has been launched on July 2012. This video slot game has 15 reels and a whopping 99 pay lines! The theme of Jack Hammer 2: Fishy Business is inspired by the classic comic books that were very popular in the 1950s. Many online slots players, young and old, are actually avid readers of comic books. Even if some deem it as reading material only for children, no one can deny that the stories that these comic books tell are based on what may or may not happen in our lives. The stories make us laugh, cry, feel pain, or even become angry, and we learn many life lessons along the way when we read comic books. That is what Jack Hammer 2 is all about, a slot game that will definitely take you to a world of comic book-themed characters! This slot game is a favorite among small-time slots players because of its 15 reels and 99 pay lines. This means that you can frequently win, but the amount is not very high. Still, in order to help you make your winnings much bigger, Net Entertainment has created some very handy features in this slot game – Free Spins with multipliers, Wild symbols, and the Sticky Win feature! In case you are not aware how the Sticky Win feature works: whenever you get a winning combination (either with regular symbols or with Wild symbols involved), the winning symbols will remain in the reels, while the others will re-spin to help you get more winning chances. This will keep on going as long as you get more new winning combinations or if you get 3 scatter symbols! A nice thing about Net Entertainment is that they allow interested players to play instantly on their slot machine games, without the need to download anything. If you were one of those who have spent some of their childhood days reading and enjoying the stories from comic books, and you also have liked playing the first version of the Jack Hammer slot machine game, then you will surely love playing at Jack Hammer 2: Fishy Business because it has 15 reels and 99-fixed pay lines, Sticky Wins Feature, it has Free Spins with a 2x multiplier value for all of the winning combinations, and last but not least, it is considered to have a 97.1% payout ratio! Net Entertainment is always known to create sophisticated graphics and joyful sounds, just to make each and every slots player become totally engaged and have fun at the same time when it comes to playing any of their online slot machine games. Jack Hammer 2: Fishy Business has the same cartoon-like graphics and retro animations as the first one (Jack Hammer) while the characters carry on with their adventures. The symbols are drawn just like in the first one and you would not grow tired of playing this online slot game as it is very cool to the eyes. The background setting of the game is underneath a long bridge in the city at nighttime. The overall graphic design of Jack Hammer 2: Fishy Business showcases primarily the color blue, with varying blue hues and other colors such as red, yellow, purple, green, orange, black, brown and pink. The constant background sound you will hear when playing Jack Hammer 2: Fishy Business is the squawking of seagulls at the docks and the creaking sound of metal that you usually hear when you’re on a moving boat. When you spin the reels and hit winning combinations, you will hear different kinds of comic book-like sound effects. There are no card deck symbols available in Jack Hammer 2: Fishy Business. The symbols they have used are characters and other objects that complement the comic book theme of Jack Hammer such as Jack Hammer himself, Pearl, Don Crabby, Goons, the Warehouse, the Boat, the Fish Barrel, the Gun case, and the Microphone. The Wild Symbol is the Wild Explosion. The Wild Explosion acts as a substitute for all other symbols, with the exception of the scatter symbol. In the regular slot game, it appears only on the 2nd, 3rd, 4th and 5th reels. In the Free Spin Bonus Feature game, it appears only on the 2nd, 3rd, and 4th reels. What’s great about Jack Hammer 2: Fishy Business is that it has a Sticky Wins Feature, which makes playing online slots here all the more fun and exciting. The Sticky Wins Feature can be triggered in 2 ways: either you get winning combinations, or 3 Electric Eel Free Spin Scatter symbols. The bet line wins pay if in succession from the leftmost reel to the right. The number of coins you have bet per pay line multiplies pay line wins. The reels with winning combinations are then held while all the other reels Re-spin for the chance to get bigger wins! Do take note that the reels will keep re-spinning, provided that you get new or increased wins. The Sticky Wins Feature will end once there are no new wins generated, and all of the active winning combinations are paid out. The Scatter Symbol is the Electric Eel Free Spin. Scatter symbols are not required to appear in a line for you to win. This Scatter symbol can be found anywhere on the reels. If you hit 5 or more of this Scatter symbol, you will activate the Free Spin Bonus Feature game where you can win up to 20 Free Spins! Jack Hammer 2: Fishy Business’ Free Spin Bonus Feature Game – the bonus feature is triggered when you get 5 or more Scatter Symbols (Electric Eel Free Spin) that can be found anywhere on the reels. If you get 5 Scatter Symbols, you will be awarded 10 Free Spins; if you hit 6, you will be awarded 13 Free Spins; if you hit 7, you will be awarded 16 Free Spins; and if you hit 8, you will be awarded 20 Free Spins! All the winning combinations you get while playing the Free Spins will be doubled (multiplier x2)! While you are playing the Free Spin Bonus Feature game, you can also trigger the Sticky Wins Feature. What’s also great about the Free Spin Bonus Feature game is that when you get another 5 or more Electric Eel Free Spin Scatter Symbols while playing the Free Spin Bonus Feature game, you are awarded another set of 10, 13, 16 or 20 Free Spins! The additional Free Spins you get are then included to your remaining amount of Free Spins. You can win an infinite number of Free Spins during the Free Spin Bonus Feature game. When the Free Spin Bonus Feature game is over, you are then taken back to the regular Jack Hammer 2: Fishy Business video slot game, and your Free Spin game winnings are included to your total balance. 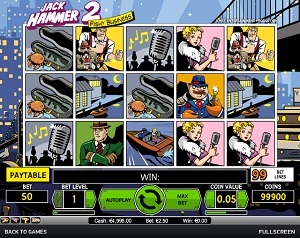 Jack Hammer 2: Fishy Business has 15 reels where you may bet on 99 pay lines. The minimum bet is 0.01 and the maximum bet is 0.50 per line. You may wager from 1 up to 10 coins per pay line bet. It is really more fun playing online video slots when there is an Autoplay function available. Jack Hammer 2: Fishy Business can be played automatically by just activating the Autoplay function which can be located in 2 ways: the standard one can be found on the lower left of the game screen (the button indicated Auto), and the other one can be found just next to the Spin button (left side). In the simple settings of the Autoplay function, you can choose how many number of rounds (spins) you would like the game to spin for you automatically. In the Advanced settings, you can choose to stop Autoplay on the following conditions: on any win, if Free Spins is won, if a single win exceeds an amount you have indicated, or if your cash increases or decreases by an amount you have indicated. When you are all done with your preferred settings, just click on the Start button and the slot machine game will automatically spin the reels for you! « More slotmachines guides Article last updated: Monday, August 22, 2016.